A body fat scale is a scale that measures body fat, and the technology powering body scales is quite innovative. Using a special type of analysis known as BIA, or bioelectrical impedance analysis, body scales are able to quickly determine the body’s fat composition and give you an overall picture of your state of physical fitness. Body scales are the best body fat analyzer option for home use. This technology involves the passage of a tiny electrical current through your foot from the scale and into your body. This current is totally unnoticeable, harmless, and innocuous, so you never feel a thing. The current passes more rapidly through muscle and fat-free tissue, but it slows down when it encounters bone or fat. Body fat percentage scales measure this resistance and translate it into a reading of how much fat your body actually contains. Because the reading rendered by the bioelectrical impedance analysis is affected by bone as well as fat, these scales are equipped to take into account your gender and age, rendering a close estimate of your body fat that’s useful in determining your physical fitness. Using Body Fat Scales in Your Diet/Exercise Routine. Perhaps more importantly than a high level of accuracy is the scales’ ability to monitor changes in your body fat composition from day to day or week to week. Knowing whether or not you are losing fat can be important, since many diets put the main focus on losing weight and watching the numbers on a conventional scale roll back. However, many popular diets today put a focus on losing weight and not on losing fat, and with many of them, you are likely looking at more fluid lost than fat being lost. This is why monitoring your body fat with a scale that measures body fat is important. Effective diet programs that target fat loss work on increasing your metabolism even when you are not burning calories through exercise, which results in permanent loss of fat. When using body fat scales to monitor body fat loss, be aware that these scales vary widely in their accuracy. 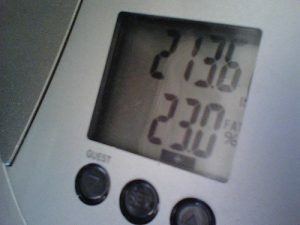 So, if you are using a scale at your gym, it may not compare to the one you’re using at home. Also, choose a scale that is the right profile for your needs; for example, athletes must have specially calibrated scales for their specific body types. A high-quality scale that offers inputs for age, body frame, and gender will render more accurate results than one that focuses solely on body composition that doesn’t account for other factors. Body fat scale accuracy can vary by manufacturer, so choose the most advanced scale possible for the best results. 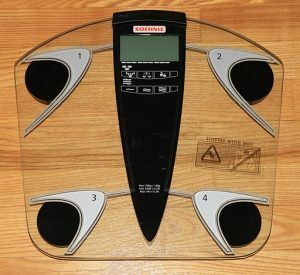 Soehnle body scale with integrated body fat and water monitor. Read reviews to find out what’s working for other people. Oftentimes reviews provide much more information about the product in question than the manufacturer, so reading these reviews provides keen insight into the best body fat scales prior to you shelling out any cash. Learn more about waist trimmers or checkout this Health o meter® Professional 402LB Mechanical Beam Medical Scale Review.